Bali to me, is like an annex to Australia. Some call the Island of Bali “Little Australia”, since it is impossible to visit without bumping into an Aussie or two during your stay. With Australia being one of the biggest contributors to Bali tourism, its love affair with the Indonesian paradise is evident, with the 2014 visitor statistics striking a record high at 71,288 in January. That accounts to approximately 25% of Bali’s foreign arrivals. Part of the Coral Triangle, Bali has something for just about everyone – whether you’re a beach-fan, nature-lover, surfer, diver, golfer, historian or a curious foodie like me. A major plus - its affordability factor. so you’ll need adapters with two rounded pins. Power supply is usually 220 volts, 50 hertz. and a Customs Declaration Form. Only the Customs Declaration Form (one per family) was handed to us on the flight prior to landing, and we didn’t know that there was another Arrival Card that needed to be filled up until we got to the immigration counter (after going in line). Make sure you pick up the Arrival Card before getting in line at the immigration counters. Just note though that your Passport must have at least a 6-month validity. Click here for the list of 64 countries and 1 region currently eligible for a Visa on Arrival. Effective April 2014, Airport/Departure tax is Rp.200,000 per person. This applies to all passengers, including Indonesian citizens. Make sure you have sufficient cash on hand. Also, when calculating your travel time to the airport, always account for traffic congestion. To avoid missing your flight home, check with your hotel/host on the best time to leave for the airport. If possible, the best option would be to get the conversion done at your home country. Due to a bad past experience, I would strongly advise against doing it at a local moneychangers, but if you have to, I’d recommend the use of banks. When you receive your money, count again in front of the moneychanger – they can cheat you by sneakily flicking some notes off, even as they are counting it before your eyes (and giving you lesser notes than you are supposed to receive). Also, always insist on an official receipt at the time of the transaction and take your time to make sure the money received matches the total shown on the receipt. A 10% serivce charge is normally added to your bill at hotels and restaurants. Although tipping is common, no additional gratuity is required or expected. If you’re getting into a taxi, you should insist that the taxi driver switch on the meter at the beginning of the ride since some of the drivers tend to “forget". The starting fare is Rp.6,000. Bluebird Taxi Drivers follow strict company regulations to switch on the meter immediately. With other companies you might have to insist or remind them. 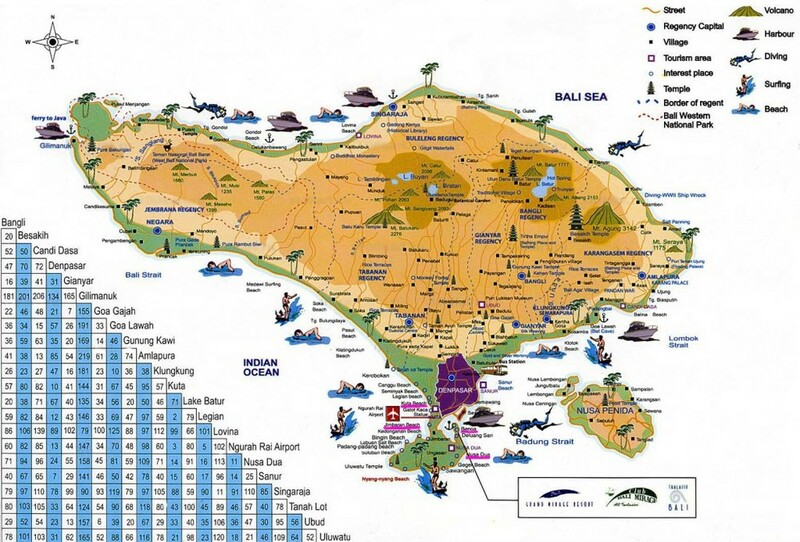 For more on getting around in Bali, click here. When planning your Bali travel dates, you may one to note that the dry season is typically between the months of April and September, while the rainy season falls between October and March. Most say that the best time to visit is from the end of May to August, when humidity levels are low and a cool breeze blows day and night. FYI, the sun rises at 6am and sets at 6pm most of the year. Bali's time zone is UTC/GMT+8 (same as Malaysia, Singapore, Hong Kong, China, Taiwan, Philippines, Mongolia and Western Australia). Hope this helps! If you’ve travelled to Bali before, please feel free to add your personal tips in the comment box below. Where to stay in Bali? A hotel review. In Bali, you can spend anything from USD5 to over USD17,0000 a night on accommodation. …and from there, decide on where to base yourself. This should help. Close to the airport and the center of all action with numerous pubs, open bars, discos, all kinds of super markets, department stores, shops and restaurants. Populated by surfers and sunbathers, its five-mile stretch of sand is great for people-watching, if you’re into that sort of thing. The annual Bali Fashion Festival brought my husband and I to the heart of Kuta this month, which led us to the discovery of this perfect little sanctuary of tranquility amidst the chaos of Kuta.